This gift tray has a length of about 9.5 in, a width of about 8.5 in, a height of about 2.5 in and a Net WT of 2 lbs. Sometimes the simple gifts are the best, especially when the quality of the gift is evident from the start. That’s exactly what you’ll find in our Nuts & Dried Fruit Gourmet Tray. Without question, it’s the very definition of elegant simplicity: a well-made, visually appealing wooden box tray filled with two full pounds of our finest gourmet treats. Simple, because there are no frills or distractions; elegant, because the tray presents just four of our most prized all-natural snack selections, including hard-to-find Jumbo Cashews and Colossal Pistachios. There’s no picking through or sorting out required, because every corner contains some of the best gourmet snacking available today. It begins with our acclaimed Salted Giant Whole Cashews: extra-large, first-quality unbroken nuts that have been roasted to creamy perfection and then lightly salted to bring out their exceptional flavor. Your recipient will find them absolutely irresistible—and that’s only the beginning! Continuing on, it’s almost impossible to imagine the quality of our Salted Colossal Pistachios. These are nothing like the third-class nuts you’ll find in the stores! We source them direct from the finest growers in California and hand-select only the best for our gourmet gifts. You’ll find them universally large and blemish-free, packed fresh from our own on-site roasters. The shells will be partially open for easy snacking, and the premium nuts come pre-salted for best flavor. Next, our Salted California Almonds are also very large, beautiful nuts flown in fresh from the groves and expertly roasted and seasoned in our on-site facility. The skins are intact, the nuts come out a gorgeous dark golden brown, and the flavor is simply phenomenal. Finally, our tour ends with the sweetest prize of all: our acclaimed Jumbo Dried Apricots, the largest and sweetest apricots you’ll find, naturally dried and preservative-free. You’ll find these delectable apricot halves incomparably moist and tender, with a rich tangy flavor that speaks of sunshiny summer days. 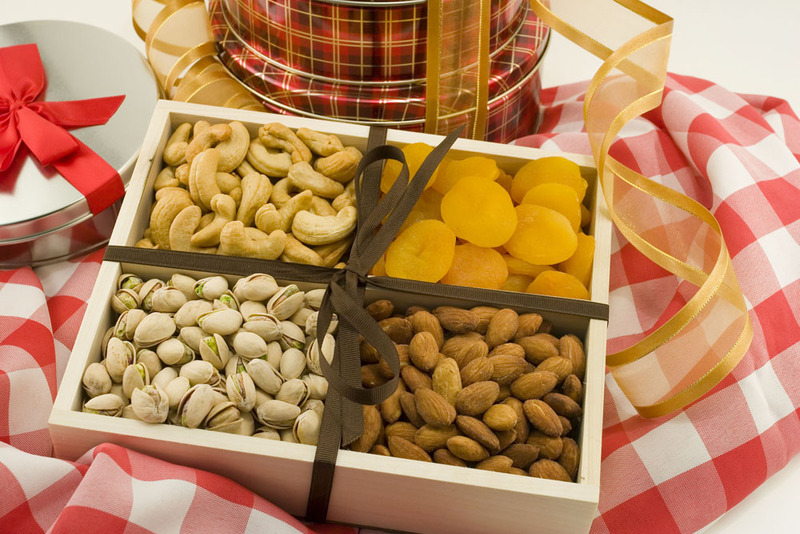 Altogether, our Nuts & Dried Fruit Gourmet Tray will make a superb gift for anyone on your list—and better yet, it’s one of our special selections that includes FREE shipping on every purchase! Giant Cashews (Cashews, Peanut Oil and Salt); Pistachios (Pistachios, salt); Almonds (Almonds, Peanut Oil and Salt); Apricots (Apricots, Sulphur Dioxide). I did not have a chance to try these nuts because they were sent as a gift. The person who received them was very happy and said how good they are.....I hope in the near future to try them myself, Your service was excellent and ordering was very easy. ConsWish they could have been delivered closer to Christmas. Was very well pleased with my purchase. It was a gift so I did not taste any of the "goodies" but the presentation was great. I was also impressed with the container. The wooden box was well made and looked great. Perfectly perfect nuts and apricots! We're order these by the dozens each year for clients (and some for ourselves). We have always been pleased with the quality of the nuts and the freshness of the apricots. Our clients always that us for this delicious gift. ProsProduct quality as well as the great package design - first rate. This was a gift for my Dad and he absolutely loved it. He said they were the best fruit and dried apricots that he has ever had. this was a birthday gift for our brother....he contacted me to say how much he appreciated the gift - we are all making promises to eat healthier - so the gift helped to support our health goals!! He said the quality was terrific. Product was very good, shipping not so much. This was a gift for our friends 75 birthday. It arrived two days late and was a bit of a disappointment for us because we ordered it time to get there on his bday or before. He said the gift was great and your nits are always the best. ProsYou product is always top of the line. ConsShipping time did not deliver on time. Bought this for 3 of mysiblings. Heard from all 3 that they loved it. ProsNice assortment of 3 types of nuts and dried apricots. I ordered this as a gift for my sister.I did not see it or taste it.My sister was very happy with it,she said it tasted excellent and was so fresh.It was delivered super fast and free shipping which was a plusYes I would order again from this company. So Happy with the Order! This was a gift to a friend! She is very happy with the fruit and nut basket. The cashews were indeed large and tasty! The gift arrived on schedule, and I appreciate your efficient service. The nuts were received with great appreciation to for a person who has everything and did not want any for his 75th birthday. Were well enjoyed by him. I sent this basket to my parents for their anniversary and they loved it. I purchased the Gourmet Tray for my Employer as a Wedding Anniversary Gift. They liked it very much!